Sister Martha entered Maryknoll in Valley Park, MO on October 18, 1960, from St. Michael’s Parish, Charlestown, IN. She received her B.S. in Education from Nazareth College in Nazareth, KY in 1959. After her First Profession of Vows on June 24, 1963, Sister Martha worked at the Center at the Local Secretary’s Office. Then Sister Martha was assigned to Chicago’s Chinatown to teach at St. Theresa’s Primary School from 1964 – 1967. Sister Martha’s first foreign assignment was to South China in 1967, where she started with language study at Hong Kong University. Afterwards, she was assigned to the Maryknoll Sisters School at Blue Pool Road in Hong Kong teaching Religion, Geography, and English Literature from 1968 – 1972. Sister Martha then moved to Kwun Tong at the Kwun Tong Resettlement Area in Kowloon, and taught English grammar in Grades 4 and 6 at Our Lady of China Primary School from 1972 -1977. 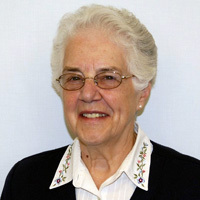 In 1978, Sister Martha returned to the Maryknoll Sisters Center in NY and was manager of the Maryknoll Sisters Communication and Public Relations Office in New York from 1979 – 1984. Sister Martha returned to Kwun Tong, Kowloon in 1984, where she served as editor and lay-out artist with Union Catholic Agencies News (UCAN) for 5 years. In 1994, Sister Martha returned to the Maryknoll Sisters Center in NY and served in the Mission Archives Department for nine years. In 2004, she was appointed Coordinator of Government Benefit Programs for the Congregation’s Treasury Department. Currently, she still resides at the center.